Skid Steer Tilt Trailers | Quality Trailers Inc.
Quality Trailers offers a 15,000 GVWR Professional Grade skid steer tilt trailer. 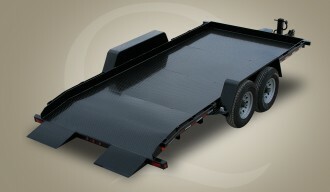 This trailer is ideal for in-city construction work where a short length trailer is needed. Professional Grade: Heavy duty frame with 16″ cross member spacing, radial tires, LED rubber mounted sealed beam lighting in enclosed boxes with sealed modular wiring harness.